A man is behind the steering wheel in a car and a woman is in the passenger's seat adjacent to him. Man: We're completely lost. There goes the weekend. Man: I told you not to upgrade your IOS. In the next panel, the man alone is seen in a close-up view, still behind the steering wheel, now holding a rectangular object in his hands. Off-panel voice: Can your amazing Android get us out of this mess? 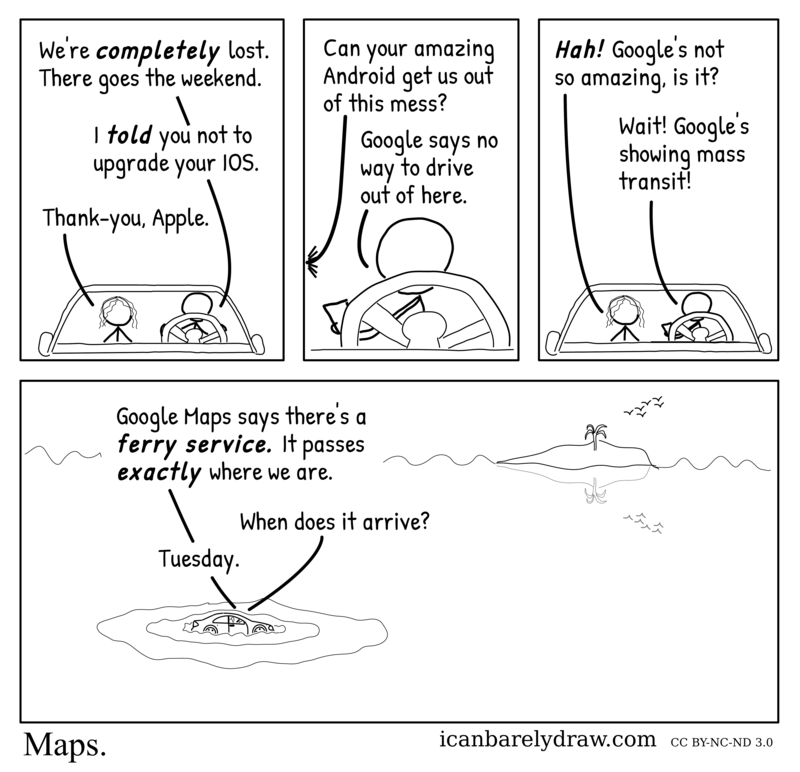 Man: Google says no way to drive out of here. In the next panel, both the man and the woman are again seen in the car. Woman: Hah! Google's not so amazing, is it? Man: Wait! Google's showing mass transit! In the last and final panel, the car is now seen in the distance, half-sunk into a body of water. Far away, over the horizon, there is a small island with a tree growing on it. Not far from the island and the tree there are birds flying. Inverted reflections of the island, tree, and birds are visible in the water. Voice 1 from car: Google Maps says there's a ferry service. It passes exactly where we are. Voice 2 from car: When does it arrive? Voice 1 from car: Thursday.